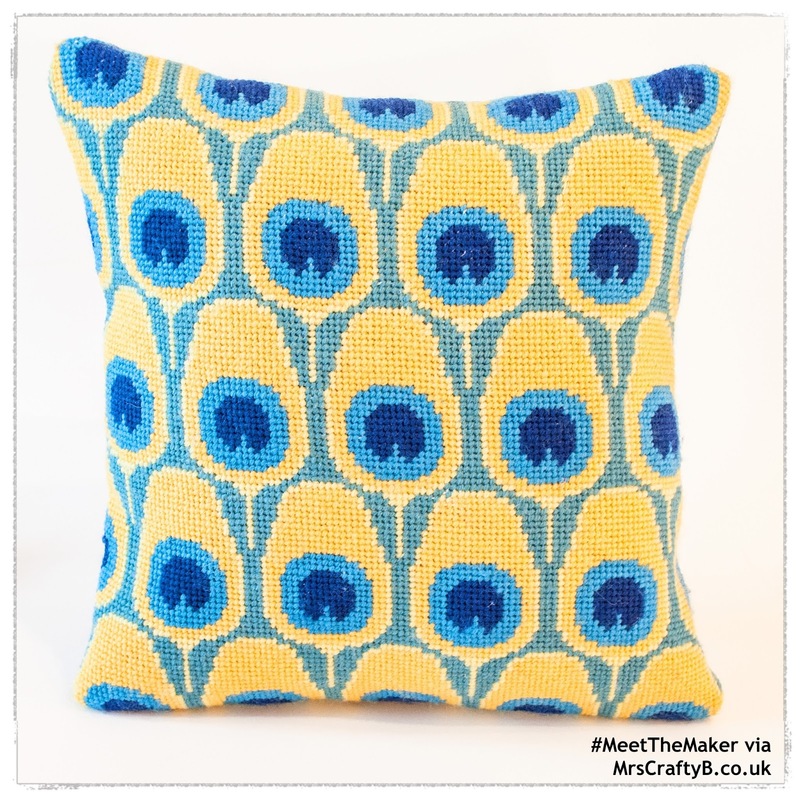 This beautifully designed needlepoint cushion was created by Jenny of Jenny Henry Designs and she joins us for today's interview with an insight to her crafty world. Hi Jenny. Can we start with a couple of facts about you? I designed, stitched and sewed this peacock needlepoint cushion. I started stitching and sewing all my needlepoint cushion samples a couple of years ago. I was trying to go through the steps that my customers would need to go through with the needlepoint kits so that I could create a really fluid experience for them. In America, it is common practice for needlepoint shops to outsource all the sewing to professional finishers. As a consequence needlepoint, in America is a very costly endeavor. I set my mind to creating quality kits that could be easily finished by the individual and therefore make it a more accesible past time. This Peacock Pillow is the result of that endeavor and is one of the ten patterns offered in the series. 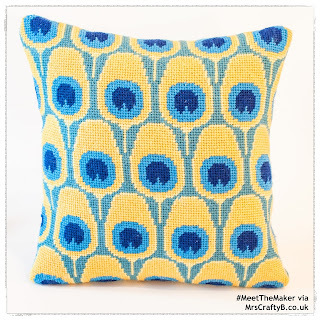 The Peacock design is made with a simplified color pallette and easy repeat pattern. You can either choose from a charted kit (more affordable) or a handpainted one where every single stitch color is layed out for you. I handpaint all my needlepoint canvases for the kits myself. That must be hard work Jenny. I guess you have a very steady hand and lots of patience. So how did you go about learning to design needlepoint? I learned to design and paint needlepoint canvases 19 years ago when after driving from New York to San Francisco with my best friend I found myself in desperate need of a job. My only skill set was that I could draw and paint and I answered an ad in the San Francisco Chronicle for a needlepoint painter. Prior to this I had never stitched a stitch. Later I would realize that this job was in fact my destiny and stitching was in my blood. After 5 years of working at Needlepoint Inc. I decided I would get married and we moved back to the other side of America again. I kept designing for Needlepoint Inc. but also started working on my own brand and vision of what I thought needlepoint could be. As far as sewing goes, I am an amateur and still learning but loving it. What made you decide to turn your creative skills into a business? My first creative business was when at age 11. I created paper doll sets and sold them to my classmates. Creating Jenny Henry Designs as a means to create modern, accessible needlepoint kits just made sense at the time because I saw a gap in the market but probably a more honest answer is that I was made to create and this business allows a means to do that. It is so great that you have found a calling in life that allows you to earn from it and encourage others to be creative. What keeps you inspired and motivates you? I am inspired by pattern, by nature and by my kids. I am motivated by a primal urge to make things. Can we connect with your via social media accounts? Jenny, is this year your first at the Handmade Fair? This is my second Handmade Fair. I attended the first one in 2014 and had an amazing time. Visitors can expect to see lots of wonderful vendors and creatives and all kinds of crafty superstars. Seeing some of the other needlework people and to showing my daughter Hampton Court Palace. Oh it is beautiful! It was our go to place for school trips growing up. What will visitors find at your stand and where will we find you? This summer I am running some needlepoint workshops for beginner tweens and teens here in Baltimore, USA. I will be taking my kids to the pool as much as possible and in the evening prepping like mad for the Handmade Fair. Eek! So exciting. I hope the kids will be lending a hand?! Right so a quick fire round to finish up. Your crafting hero? The New Craft House, Pom Pom Design and Hannah Bass Tapestry. My Dad made me an Eve and serpent mirror carved from different types of wood that I treasure. The beach, any beach but especially the one in Buxton, North Carolina. My children, my husband, going for walks and making stuff. Crafty bliss at a palace. I love that description Jenny haha. Thanks so much for taking part in this feature and I can't wait to come and visit your stand. You're on the priority list so I can bag myself a chart ;-). Who's with me Crafty B's? Fancy a bit of needlepoint?